Technology is not a modern invention. It has existed since someone, somewhere, used a sharp stone to cut a piece of food. What has technology to do with the Bible? Here’s an example: Samson had gloriously long, thick hair that had never been cut. When Delilah tried to worm the secret of his strength out of him, he told her that if she wove his hair into the frame she used for weaving, he would be no stronger than other men. Of course he was lying, but the interesting thing is that the Bible story-teller took it for granted that everyone in his audience would be familiar with a weaving loom, and know how it worked. Looms were common in the world of the Bible, because all the fabrics used in an ordinary household were made by the women of the family. There was no store-bought fabric. Sheep and goats had been domesticated about 10,000 years earlier, and as well as giving our ancestors milk and meat for food they provided wool for cloth, and so the art of spinning developed. 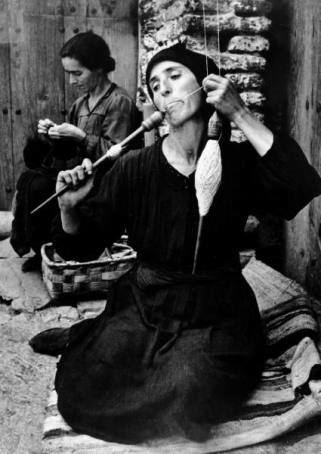 Mesopotamians developed the spindle and the distaff to spin wool by hand. The distaff is a small stick with a slot on one end to hold lumps of wool. The spindle was a straight stick held between thumb and finger. By twirling the spindle, a thread could be drawn off the distaff. The fibers were twisted together so that they formed a continuous thread. The spinner, usually a woman or girl, kept the spindle going by attaching it to a small clay disk called a whorl. A whorl is able to store up energy and then release it, to give a machine momentum to rotate at a constant speed. Over time the whorl developed into a spinning wheel, which was operated by a foot pedal. It too moved at a constant speed. The earliest version of a spinning wheel was used by ancient Greeks and Romans, but curiously enough the spinning wheel as we know it does not seem to have ever been used in the Middle East. All the biblical women, even those who were of royal blood, would have known how to spin – though admittedly it is hard to think of Queen Jezebel sitting at a spinning wheel. 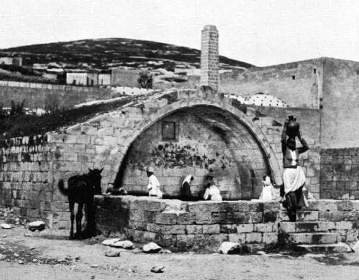 Mary of Nazareth must have gone to the village well thousands of times to draw water from its depths. Hopefully there was a pulley or a winch at the top of the well, to help her. 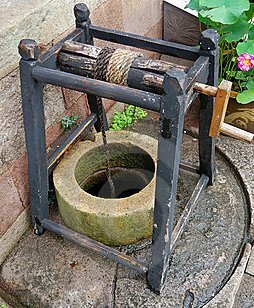 Try pulling a bucket of water up out of a well without a pulley. It’s heavy. You are lifting the full weight of the water with your arms. Now try using a pulley to lift the bucket of water. This time you can use the weight of your own body to lift the weight. It makes the job much easier. 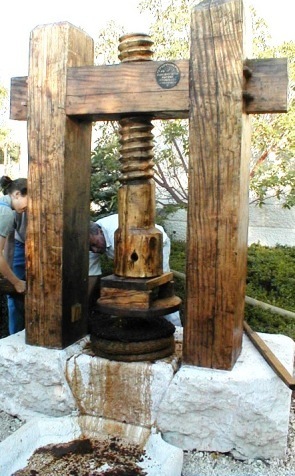 Pulleys were used by the Romans, who were great engineers. Since there was an enormous construction project going on in the nearby city of Sepphoris, it is reasonable to think that Nazareth, just four miles or so away, would have known about the pulley. A pulley is a wheel with a groove running round its rim; this groove is deep enough to take a rope. The first image of a pulley is from a battle scene in ancient Assyria in the 8th century BC. There were various types of pulleys, with the most sophisticated being a compound pulley, usually called a block and tackle. With this more sophisticated pulley, one pulley is attached to a fixed support, like a strong hook in an overhead beam of wood. Other pulleys are attached to the load or to ropes. These movable pulleys multiply the force, so that the strength needed to lift a load is reduced. 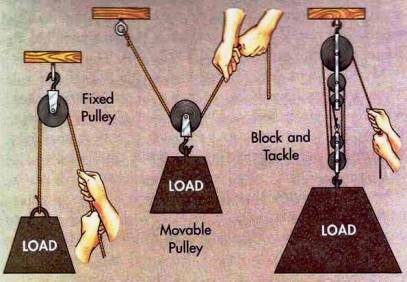 Each movable pulley in a compound pulley lessens the force needed to lift the load. With one movable pulley, the effort needed is halved. With a block of five pulleys, the effort is divided by six. There is a theory that the Egyptian pyramids were built not with ramps, but with pinion pulleys that walked the large blocks of stone up the ‘steps’ of the pyramids – all the pyramids were stepped, until the final smooth layer of white stone was added. The Temple built by Herod the Great, in which Jesus taught, could not have been built without the sophisticated pulleys and cranes developed by Roman engineers and used extensively throughout the Roman Empire, of which Palestine was a part. The wheel and axle were used to make chariots and carts – a major development in the ancient world. 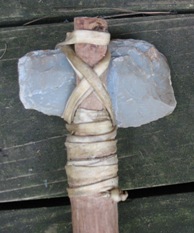 The Assyrians also used them to make a windlass, or winch. This has a handle connected to a center axle and a length of rope, and when the crank was turned, the rope wrapped around and around the axle, lifting the object attached to the rope. A lathe is a tool for shaping wood or metal. It has a sharp blade which cuts and smoothes the material being forced against it. Lathes were operated by foot pedals at first, but later became more sophisticated. Among other things, it can be used to carve decorative legs for chairs and tables. 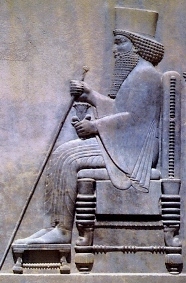 One example is shown in the wall relief of King Darius of Persia (550-486BC) sitting on his throne – Darius may have been the model for the foolish, gullible King Artaxerxes/Ahasuerus in the story of Esther. Notice the legs of the throne, which seem to have been carved on a lathe. Screws are fastening devices, but they can also be used to apply pressure, or to lift a heavy load. Turning a screw provides force that presses two pieces of material together. Some car jacks are actually just large screws. In ancient times, the main use for a screw was to magnify the force needed to squeeze oil and juice from grapes and olives – important in the diet of a person in the biblical period. Some screws were so large they were turned by oxen. Others could be operated by a single person. The screw was upright. Turning it put upward pressure on a lever. One end of the lever moved up, as the other moved down. This squeezed the olives or grapes held in a container at the base of the screw. Queen Jezebel: wicked or just misunderstood?